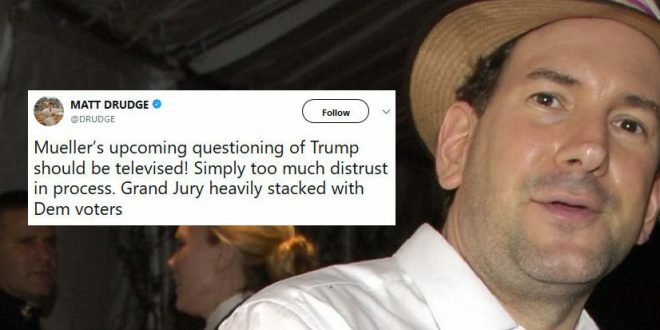 Matt Drudge: Televise Mueller's Questioning Of Trump - Joe.My.God. No questioning is scheduled, but homocon Drudge is on it. Drudge Report founder Matt Drudge said that special counsel Robert Mueller’s questioning of President Trump “should be televised.” Trump said last week that he didn’t know if he would interview with Mueller in the probe. “I don’t know. I mean I – nobody’s asked me to do that,” Trump told Fox Business Network’s Maria Bartiromo. Mueller impaneled a grand jury in August as part of the investigation into Russian interference in the election.